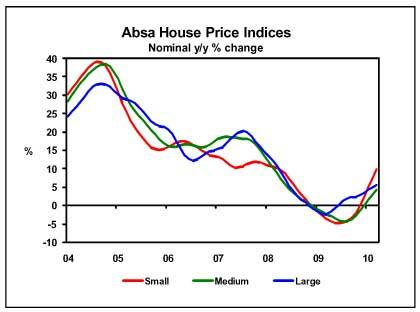 The average nominal value of small, medium and large houses for which Absa approved mortgage finance (see explanatory notes), jumped further in March 2010 compared with a year ago. On a month-on-month basis, home values in all three the abovementioned segments were also higher in March compared with February. After adjustment for inflation, house prices were in February still down in the medium and large categories on a year-on-year basis, but were up in the segment of small housing. The average nominal value of medium-sized houses (141m²-220m²) increased by 4,2% y/y in March, after rising by a revised 2,8% y/y in February. 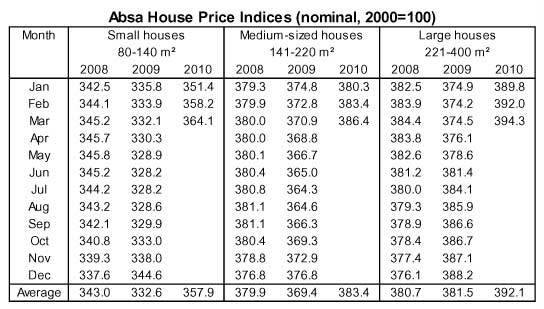 This brought the average nominal value in this category of housing to around R965 300 in March. In real terms, the average value of medium-sized houses was down by 2,7% y/y in February, after declining by 4,5% y/y in January. In respect of large houses (221m²-400m²), the average nominal value increased by 5,3% y/y in March this year, up from 4,8% y/y in February. This brought the average value of a large house to a level of about R1 438 200 in nominal terms in March. In real terms, the average value of a large house was down by 0,9% y/y in February, compared with real price deflation of 2,1% y/y registered in this segment of the market in January this year. The South African economy is forecast to grow by a real 3,3% in 2010 (-1,8% in 2009) on the back of the global economic recovery and steadily growing domestic demand. CPI inflation, currently at 5,7% y/y, is expected to average 5,3% in 2010 (7,1% in 2009). However, a stiff electricity price hike, as well as food price, rand exchange rate and oil price movements are still regarded as possible threats to the inflation outlook for 2010. Against this background, interest rates are projected to remain unchanged for the rest of 2010, after being cut by a further 50 basis points in March this year. A rate hike of 50 basis points is expected in the first quarter of 2011. With household sector finances expected to improve during the course of 2010 on the back of the economic recovery, leading to higher levels of employment and growth in household disposable income, the residential property market is forecast to gather further momentum. Growth in the nominal value of houses is forecast to be 6% - 7% higher in 2010 compared with last year. 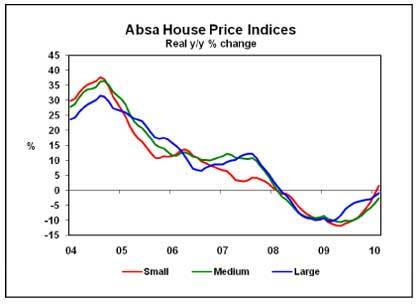 The Absa House Price Indices, available back to 1966, are based on the total purchase price of houses in the 80m²- 400m² size category, priced at R3,1 million or less in 2008 (including improvements), in respect of which mortgage loan applications were approved by Absa. Prices are smoothed in an attempt to exclude the distorting effect of seasonal factors and outliers in the data. As a result, the most recent index and price growth data may differ materially from previously published figures.